Independent Blinds & Awnings specialises in all types of awnings. We supply a variety of awnings to suit your needs from commercial shading solutions to domestic patio or verandah awnings, we provide a complete service at highly competitive rates. Our clients include,* schools, offices, sports grounds and homes, please contact us today to see how we can help you. Once we receive your details, we’ll come to your house to provide your free measure & quote. You’ll receive your quote onsite right there and then. Folding Arm Awnings are like adding an extra room to your home or unit without the huge construction costs. Great for Outdoor areas, create lots of shade and protect your window from the hot summer sun and by having shade over your windows also cuts down heat inside the house, excellent for patios, verandahs, restaurants or store fronts. They can be Manually or Electronically operated and integrated with sun and wind sensors. Folding Arm Awnings provide excellent UV protection without obstructing your view. Fixed Framed Awnings are usually made specifically for an area that does not required moving awnings, such as roll-ups, etc. These awnings are permanently fixed. Also, Aluminium fixed awnings are available. Automatic Awnings are available as traditional roll-up awnings. Strong winds will roll the awning up. 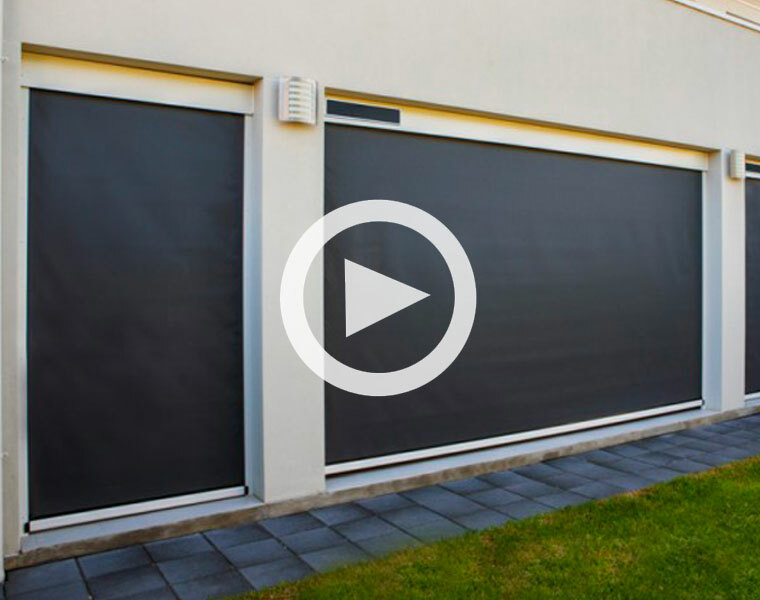 Ideal for windows and verandahs where privacy and sun protection are most needed. Drop Arm Awnings/Pivot Arm Awnings are the simplest form of awnings, they are a heavy duty System, ideal for large openings.They are ideally suited to fit over standard doors and windows also cutting the glare on windows helping to cool your interiors.This product provides great airflow and controls harsh sun conditions. The simple gear-operated drop-arm awnings can be motor operated, sun and wind sensors are also available. The blinds are adjustable to any position in a 90 degree arc. They are durable enough to withstand high winds and have concealed springs allowing for a nicer looking finish. Drop arm awnings are available with an optional cassette to protect the fabric of the awning and can be designed using all available fabrics. A unique awning designed to maximise the use of your outdoor area in every season without creating a visual barrier. The clever designed side channels can be used as posts as well. The awning can be stopped in any positing with a simple twist of the bottom rail. Enhance your windows, patios and decks with this sleek and modern shading alternative. Wire Guide Awnings are a vertical drop awning with a contemporary aesthetic and suitable for any architectural context, be it modern or classic. This practical and versatile awning system is strong and easy to operate. Our Wire Guide Fabric Awnings move up and down with the assistance of a heavy-duty gear operated system, coupled with a crank handle. Operation also can be motorised. Stainless steel cable guides on each side of the blind hold the fabric in place, making it a better choice for windy areas and coastal locations. Ziptrak® Outdoor Blinds/Awnings have specially designed slotted tracks in which the fabric glides smoothly and easily, stopping at any position. Ziptrak® blinds can be secured and locked in the down position to guard against high winds and UV – no zippers or buckles required, it’s that simple! Ziptrak® stops the weather entering your area due to its unique 30mm side track and the result is a perfect seal and you, your family and friends can relax and indulge in your own private sanctuary while your Ziptrak® keeps the wind, the sun and pesky insects outside. Ziptrak® can be installed in clear PVC or a variety of sunscreen fabrics, spring operated and also motorised.